The Little Gem Magnolia grows in a more compact and upright form than other Southern Magnolias; with small elliptic to oval dark green leaves with characteristic long rusty-brown undersides. The small, white flowers bloom profusely in the early and late summer. 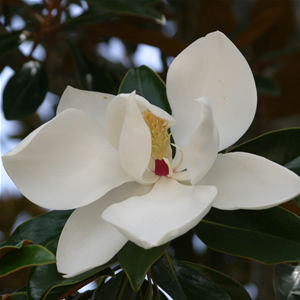 Magnolia grandiflora ‘Little Gem’ grows to be 20-25 feet in height and 10-15 feet in width.